Capital One’s No Hassle Rewards program enables its customers to earn either miles or cash back, differing from many other rewards programs that strictly operate on a points system. Featuring some of the most lucrative and popular rewards cards on the market, like the Venture® Rewards and Quicksilver® Rewards, the program allows members to redeem for useful and convenient perks like gift cards and travel. Although No Hassle Rewards may initially appear to be more complex than other issuers’ programs, we can help you to make sense of it., We’ve gathered and evaluated all the information necessary to help you better understand No Hassle Rewards and ultimately maximize the value of your plastic. So, let’s find out if Capital One’s rewards program is really as rewarding and hassle-free as the company’s star-studded marketing would lead you to believe. 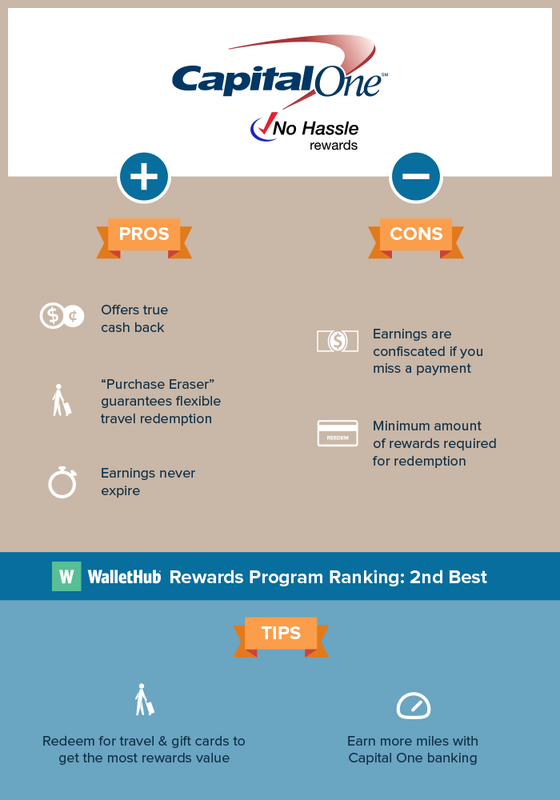 4 Pros & Cons of No Hassle Rewards 5 Where Does No Hassle Rewards Rank? No Hassle Rewards earning rates vary from card to card, with customers receiving either 1 -2 miles or 1% – 2% cash back per dollar spent. Unlike most other rewards program, No Hassle Rewards offers a very straightforward structure, which provides a host of benefits but does not lend itself to gaming or tricks to earn more. The only real way that you can significantly boost your earnings is to open the account that will maximize your rewards based on your spending habits. Earnings Never Expire – Your No Hassle miles or cash back dollars never expire by date or from account inactivity. No Earning Cap – There is no maximum limit for how many miles you can earn or how much cash back you can receive. No Minimum Threshold – There’s no need to spend a certain amount on your card in order to begin earning rewards. True Cash Back – No Hassle cash back credit cards provide true cash back as a rewards currency. For example, if your card offers 1.5% cash back, you actually receive 1.5% of all the money you spend back in cash. Because there aren’t any points or miles involved, consumers don’t have to worry about devaluation. Earnings Can Be Confiscated – If you miss a payment, you will lose any miles or cash back earned in the billing cycle that the late fee is posted to. Lack of Program-Wide Ways To Earn Extra – Unlike several other rewards programs, No Hassle Rewards doesn’t offer any all-encompassing methods for members to boost their earnings. For example, Chase Ultimate Rewards gives out 2X the points whenever customers pay for travel through their booking tool. Now that we’ve covered how you can maximize your No Hassle earnings, it’s time to translate those earnings into rewards. We at WalletHub really stress the importance of redeeming your rewards through the most lucrative option possible, to maximize the value of your card. So, the critical question is: Which redemption option gives you the most value for your earnings? The answer ultimately depends on what type of account you have, as No Hassle miles employ a different redemption system than cash back. We therefore did the math for each type of reward separately in order to provide you with the best and worst redemption options across all types of accounts. If you have a No Hassle Miles credit card, redeeming for travel and gift cards provides the most value. Merchandise and cash back, on the other hand, only yield about half the value. How Much Are No Hassle Credit Card Miles Worth? The following table displays a more detailed breakdown of the graph above, indicating the monetary value of each mile when redeemed through the various options provided by No Hassle Rewards. Capital One’s cash back cards simply return a portion of your spending in the form of cash, which makes the valuation very straightforward: If you earn 1.5% cash back on all your purchases you will receive a rebate equal to 1.5% of what you spend. That dollar amount can then be paid out in the form of a statement credit, check or gift card. No Travel Constraints – When booking trips through the “Rewards Center,” there aren’t any limitations on travel provider options, travel dates or seat availability. In other words, Capital One doesn’t restrict your travel preferences simply because you’re paying with miles. “Purchase Eraser” – No Hassle Rewards gives miles credit card users the flexible option of “erasing” past travel-related purchases from up to 90 days ago from their bill. Travel-related purchases, as you can see below, include taxis, airlines, buses and more. No Minimum Threshold For Cash Back Credit Cards – Cash back credit cardholders can begin redeeming for cash back at any point. Automatic Cash Redemption – Cash back credit card users can set up automatic redemption based on a date or when earnings hit a specific threshold in order to regularly benefit from their rewards. “Rewards Center” Only Accepts Miles – You can only use miles to book travel through Capital One’s internal booking tool, which means you’re grounded if you don’t have enough saved up. This represents a big disadvantage relative to programs that enable customers to pay for what their rewards earnings can’t cover. Minimum Threshold For Miles Credit Cards – Cards earning miles need at least 5,000 miles to begin redeeming for cash back. Capital One’s No Hassle Rewards does not feature any transfer partners. While this might appear rather restrictive in terms of travel booking (especially in stark contrast to Amex’s 21 transfer partners), because No Hassle miles can be used to “erase” travel expenses charged to the card, cardholders are not obligated to use the Rewards Center for all travel purchases. The lack of transfer partners means the highest rewards valuation one can garner from the program is one cent per mile/cent in earnings. Other programs with transfer partners usually feature a few external loyalty programs that yield up to 1.25 cents per mile/cent when you transfer your earnings. Now that we’ve examined all the details of the No Hassle Rewards program, let’s evaluate its overarching pros and cons, as well as its “fluff” – or useless – features that you can effectively disregard. “Purchase Eraser” – No Hassle Rewards boosts its versatility by enabling credit cardholders to use their miles to offset any travel-related expenses that post to their bills. Earnings Never Expire – Your No Hassle miles or cash back will never expire by date or due to account inactivity. No Minimum Threshold For Earning – There is no minimum amount cardholders need to spend in order to begin earning. No Earning Limit – There is no ceiling on the number of miles or dollars that you can earn from this program. True Cash Back – Unlike many other programs, Capital One’s No Hassle Rewards actually features true cash back cards that won’t be subject to rewards devaluation. Earnings Can Be Confiscated – You will forfeit any miles or cash back earned during a billing cycle in which you miss a payment. Lack of Program-Wide Ways To Earn Extra – No Hassle Rewards doesn’t provide any general ways for members to earn more than the rate prescribed by their specific product. Earnings Cannot Be Combined – Miles earned from your banking account cannot be pooled together with miles earned from your credit cards in order to redeem for bigger rewards. Minimum Threshold for Redeeming – Miles credit card users face minimum mile requirements when it comes to redeeming for cash rewards. The “Rewards Center” – Capital One’s internal booking tool doesn’t permit members to pay with a combination of money and miles, rendering it difficult to redeem for travel. Furthermore, unlike the rewards programs from Amex and Chase, customers do not earn more when paying through this tool. WalletHub scoped out the main rewards programs of the largest banks, evaluating them according to a standardized grading methodology. Our objective in doing so is to help consumers and businesses compare and shop for the best rewards deals. Capital One scored extremely well – No Hassle Rewards ranked 1st for both consumer and business credit card rewards programs, as you can see in our graphs below. Where is the list of codes for categories? Will the code be provided by eligible sources?